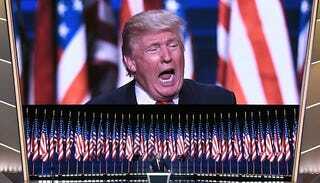 Republican presidential candidate Donald Trump speaks on the last day of the Republican National Convention on July 21, 2016, in Cleveland. Donald J. Trump turned down an invitation to address the joint convention of the National Association of Black Journalists and the National Association of Hispanic Journalists, NABJ said Wednesday as preparations continued for Friday's address by Democratic presidential nominee Hillary Clinton. C-SPAN spokesman Howard Mortman told Journal-isms that C-SPAN radio and television will carry Clinton's noon address live. C-SPAN2 will air live Thursday's plenary session "Race: A Conversation" from 9 a.m. to 10:30 a.m. A video of the race discussion is to remain available online in the C-SPAN video library at www.c-span.org. In other developments, Finance Committee Chairman Gregory H. Lee Jr., a past NABJ president, told the NABJ board on Tuesday that the organization, which took emergency measures after projecting a 2015 deficit of nearly $380,000, would likely meet its goal of a deficit-free end to 2016. The two organizations were so pleased with their collaboration this year that the NABJ board voted to explore another such partnership for 2020. At the NAHJ board meeting Wednesday, members were just as satisfied, with President Mekahlo Medina calling the collaboration "amazing," saying he hoped that "it sends a signal to the industry how important these two groups are to the country." Trump, the Republican presidential nominee, also turned down an invitation to speak at the National Urban League conference this week in Baltimore, as he skipped the NAACP’s annual meeting in Cincinnati last week, Darren Sands and John Stanton reported Wednesday for BuzzFeed News. "On Sunday, an entire Charlotte church will endorse Donald Trump," they wrote. "Trump surrogates will attempt a media blitz, trying to engage black women, veterans, and leaders over the next several days, culminating in the church’s endorsement at Antioch Road to Glory International Ministries. . . ."
They also wrote, "The candidate couldn’t face a bigger challenge than with black voters. . . ."
At the opening NABJ-NAHJ reception at Washington's Marriott Wardman hotel, site of NABJ's founding in 1975, Eleanor Holmes Norton, the District of Columbia's delegate to Congress, told the gathering that "When Trump defamed our Hispanic brothers and sisters, black people got the message. You know that Donald Trump has little to say about blacks. Our history tells us that bigotry can't really tell one of us from the other." While the two journalist-of-color associations shared billing, NABJ attendees far outnumbered those from NAHJ. NABJ did not supply attendance figures for its members or for the entire convention, but NAHJ Executive Director Alberto B. Mendoza told Journal-isms that 587 NAHJ members had registered before the convention and that he expects the number of NAHJ registrants to hit 750 to 800. He said that figure was in line with NAHJ's 30th anniversary celebration in 2014. NAHJ expects to partner with the Society of Professional Journalists and the Radio, Television and Digital News Association for the Excellence in Journalism conference in Anaheim, Calif., in 2017 and in San Antonio in 2019. NAHJ has just under 2,100 members, making it the second-largest journalist of color association, Medina told his board. At a panel titled "Covering Law Enforcement: What People of Color Need to Know," Washington Post reporter Wesley Lowery, who has been reporting nationally on police conflicts with citizens, said the media "have a bias in which we believe the system works," whereas many citizens of color historically have distrusted criminal justice institutions. "What was baffling for so many in the media was, 'Why won't people just let this play out?' " Lowery said of police abuse of citizens. "But what we know now is that the criminal justice system is not one designed to indict police officers. . . . We sometimes don't understand how deeply the bond of trust has been broken," he said. One result of the Black Lives Matter movement and increased documentation of police abuse is that many in the media "are willing to believe black people when they tell us about their lives." Using himself as an example, Lowery cited African Americans in Ferguson, Mo., who told him stories of their own mistreatment that were difficult to believe. He found those stories substantiated in a Justice Department report on Ferguson, where Michael Brown, an unarmed black teenager, was shot and killed by white officer Darren Wilson in 2014. Challenged by Jonathan M. Smith, a former Justice Department official and now executive director of the Washington Lawyers' Committee for Civil Rights and Urban Affairs, Lowery agreed that "by and large we still do not believe black people." But he said sensitivities have been heightened so much that now "I have the capacity to investigate the claims of black people," one that was lacking previously. Smith said the quality of police reports on abuse of citizens is poor, partly because police believe that they won't be read. Robert Moore, former police chief in Jackson, Miss., and a retired U.S. marshal, said he wants the media to follow up on Justice Department recommendations on improving police-community relations in Sanford, Fla., and other locations. In Sanford, Trayvon Martin, an unarmed black teenager, was shot and killed by neighborhood watch captain George Zimmerman in 2012. "We need to see who's been following up and we need to see the best practices," Moore said. Using a smartphone, Errol Barnett, correspondent for CBS News, transmits via Facebook Live a Wednesday panel, "Innovative Journalism: How Journalists Can Use Snapchat, Facebook Live, Periscope and Instagram to Break News. "Tanya Sichynsky, embedded social media editor at the Washington Post, is at center. Correspondent Michelle Miller of CBS News is standing. Lauren Victoria Burke, politic365.com: 243 Days: Will Hillary Clinton Take Qs From Journalists at Journalist’s Conference? "Wendy Williams can’t quite put the NAACP and black college controversy behind her," Scott Collins reported Monday for TheWrap. "Three top producers for the daytime talk host have been sacked, in the wake of an uproar this summer over Williams’ on-air comments about the civil-rights group and historically black colleges and universities (HBCU), two insiders have told TheWrap. Collins also wrote, "After Jesse Williams lambasted the state of race relations in a widely quoted speech at the BET Awards in June, Williams told her audience that the speech was 'poignant' — but she was critical of historically black institutions such as the NAACP. "The remarks stirred widespread outrage and led Chevrolet to drop a sponsorship deal for Williams’ show." "The Democratic Party's cleanup from its embarrassing email leak has eliminated the Latino face and voice that was its chief messenger," Suzanne Gamboa reported Tuesday for NBC Latino. "The party showed a handful of top staffers the door Monday in response to the emails' release. Among the former staffers was Luis Miranda. He was the party's director of communications — [its] spokesman for all media and a senior staffer who helped shape and deliver the party's message. "In Washington, a Latino in such a position is rare. Most are hired in lower-level positions, confined to dealing with Spanish-language media and media that caters to Latino audiences. . . ."
Miranda was previously White House liaison for Latino media. "Shawna Thomas is leaving NBC for Vice News to become its Washington bureau chief, the company will announce on Wednesday," Hadas Gold reported for Politico. "Thomas will be bureau chief for all of Vice News, both the HBO shows and Vice digital. And despite the election 'sucking all the oxygen out of the room for good reason,' Thomas' focus post-election will be on policy, said Josh Tyrangiel, head of news at Vice. . . ."
Wanda Lloyd, a veteran newspaper editor most recently chairing the Department of Mass Communications at Savannah State University in Georgia, is retiring, Lloyd told Journal-isms on Tuesday. "I had a glorious 46-year career working at seven daily newspapers and three universities," Lloyd messaged. "I loved my three years as a department chair at Savannah State. My husband has been ill for some time and now it is time to come home and care for him full time. But not to worry, I am still mentoring young journalists, I will do some writing and I'm about to start a certification program for grant writing. I'm getting my second wind." Lloyd has been, among other positions, senior editor of USA Today, managing editor of the Greenville (S.C.) News and executive editor of the Montgomery (Ala.) Advertiser, all Gannett Co. papers; and executive director of the now-defunct Freedom Forum Diversity Institute at Vanderbilt University in Nashville. She joined Savannah State as chair of the mass communications department and associate professor in July 2013. "Sunny Hostin has officially been selected to join the ladies of 'The View,' " Caitlyn Hitt reported Wednesday for International Business Times. "She will be filling the shoes of the many hosts — including Candace Cameron Bure, Rosie [O’Donnell] and more — who came before her. "According to Deadline, Hostin and Jedediah Bila 'will appear frequently throughout the season.' ABC News made the announcement today, though it does not appear that either woman will be on the show full time. "So, just who is Hostin? To some, she may be unfamiliar. Born Asunción Cummings, Hostin is a lawyer and journalist. She is a native New Yorker and has appeared on In Session, formerly known as Court TV, ABC News, Fox News and CNN. She is often selected to appear on shows to discuss legal issues, many of which pertain to social justice. While appearing on 'The View,' Hostin will continue to serve as senior legal correspondent on ABC News. "Wednesday marked [Hostin’s] first run as a co-anchor on 'The View.' . . ."